Qualified by Intel, InnoDisk’s SATADOM™ D150QV is the world’s smallest SATA SSD, featuring built-in Pin 7 VCC that enhances the functionality of various embedded applications. With its cable-less and rugged design, the D150QV provides high reliability, reduces mechanical interference, and is easily integrated with 1U systems. The SATADOM™ D150QV is also lightweight, comes with multiple channels, and is available in capacities from 2GB up to 64GB. 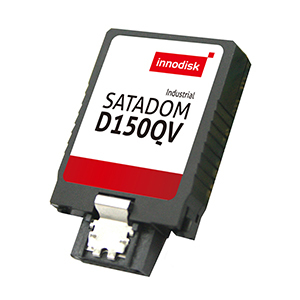 The Innodisk SATADOM™ D150QV allows manufacturers to save both time and money.